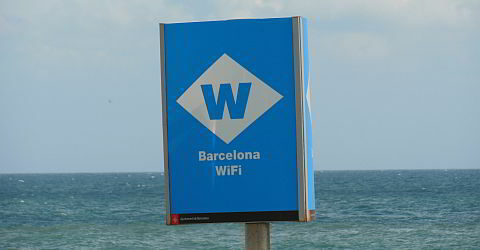 In Barcelona a free public Wi-Fi network in the entire city will be established, the "Barcelona Wifi". In many places you can already get free internet access with a notebook, tablet or smartphone. That's why the era of Internet cafes is probably over. Wifi hotspots for free "Barcelona Wifi"
There are about 180 public wifi hotspots in Barcelona, which make it possible to surf online for free with your notebook, smart phone or tablet. The stations are located close to public buildings such as museums, cafes, libraries, parks and squares. You don't need to stnd right next to the wifi sign to access the internet. The antennas usually are located a few metres from the signs and have a wide range. Most of the antennas are well hidden and barely visible. However it will probably take a few years until free wifi is accessible at every corner of Barcelona. Here you can find an overview over public Wifi-Hotspots. The era of the internet cafes seems to be over, since the free public wifi network "Barcelona Wifi" is accessible from a lot of places in Barcelona. Additionally to "Barcelona Wifi" a lot of bars and restaurants offer free wifi. There are still some internet and telephone cafes in the district Raval. However in the other districts those cafes are hard to find. It is standard for most hotels and holiday rentals to offer wifi. You can either use your notebook, tablet or smartphone to access the internet or you can use one of the hotel computers that are provided in many hotels. Most of the time this service is for free. Click on "Wifi" under additional options in our hotel booking system to request a wireless internet connection, or click on "Internet" to request the availability of provided computers at the hotel.